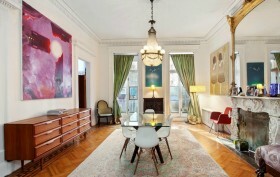 Nearly four years ago, 6sqft featured this enchanting parlor-floor rental at 34 West 9th Street. At the time, it was asking $9,850/month, but with a new batch of picture-perfect views, the price has dropped slightly to $8,950/month. 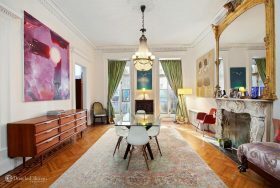 The floor-through unit is located in a traditional townhouse and retains gorgeous historic details such as fluted pilasters with Corinthian capitals, dentil moldings, intricate ceiling medallions, and two decorative hand-carved marble fireplaces. But best of all, this little slice of elegance comes with a private terrace overlooking the building’s garden below. Just imagine enjoying the dwindling days of summer from this spacious wood patio lined with greenery. 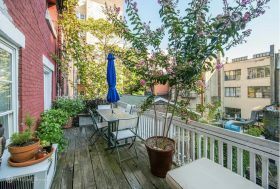 The outdoor space is tacked onto a 25-foot-wide Greenwich Village townhouse, at 34 West 9th Street, and your view is of the peaceful backyard gardens. Walk out the front door, though, and you’re in the bustle of the Village. As for the apartment, it’s still got some of the townhome’s original architectural details, including two decorative fireplaces. For the one-bedroom pad, with a bonus, window-less second bedroom, it’ll cost $6,750 a month.